Eminence Organic Skin Care is notably the best organic skin care company in the world, keeping many A-list celebrity clients looking fabulous. Boldijarre Koronczay, President of Eminence Organic Skin Care, is an icon of the spa industry. As an innovator of the organic movement, Boldijarre was honored with the International Spa Association’s Visionary of the Year Award for his lifelong dedication to education and organic wellness. Born and raised in Hungary, where he researches new esthetics treatments and natural ingredients, he approached Greta Rose Agency to establish brand authority. Our work would begin with building a dedicated website for his award-winning heritage landmark organic farm in Hungary. Rank #1 on Google Search for "Organic Skin Care"
Ranking #1 on Google is not achieved by luck or chance. Search engine optimization (SEO) is a complex process that affects every aspect of a company. Optimization must be infused carefully into company culture in order to be affective. Those who understand this are the ones who get to enjoy better ranking status. Eminence trusted Greta Rose Agency to produce results, not just theory. We performed an optimization “audit” of every existing component. We worked tirelessly with the entire company to “Think Differently,” establishing new marketing systems, media plans and SEO protocols for every department, including sales reps, distributors, influencers, brand ambassadors and media outlets. We evaluated and ultimately optimized every product name, piece of copy, video description, meta data, category, hashtag, sales tool, every internal document and talking point. Essential was the ability to maintain integrity of the brand within the framework of powerful SEO. We are proud to share the exciting success of our project. 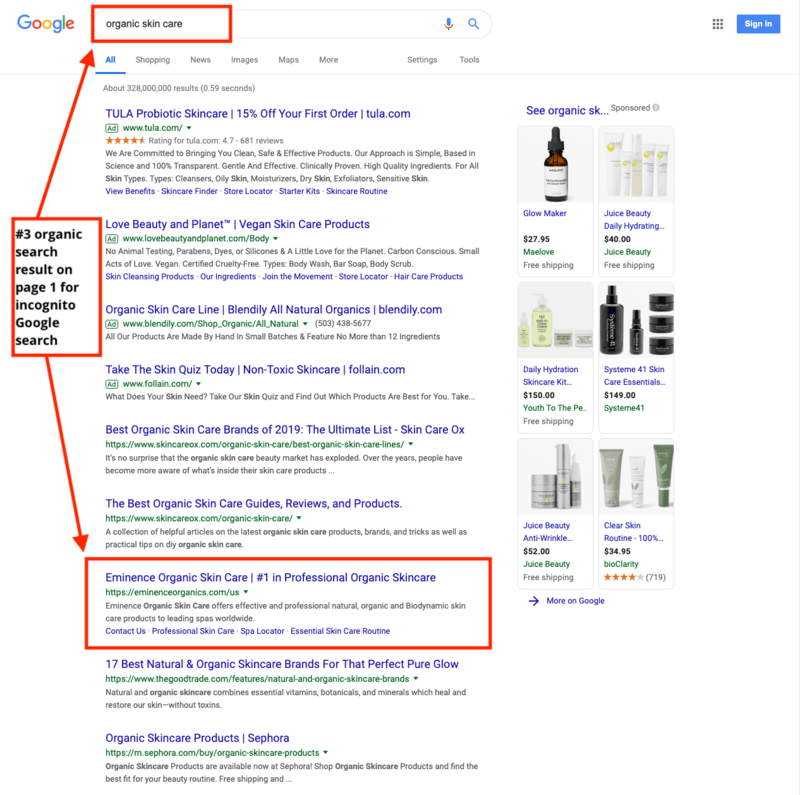 Incognito (unbiased) search queries for the broadest term “organic skin care” presents Eminence Organic Skin Care on the first page, above the fold, as an organic search, not a paid ad. This is worth bragging about! 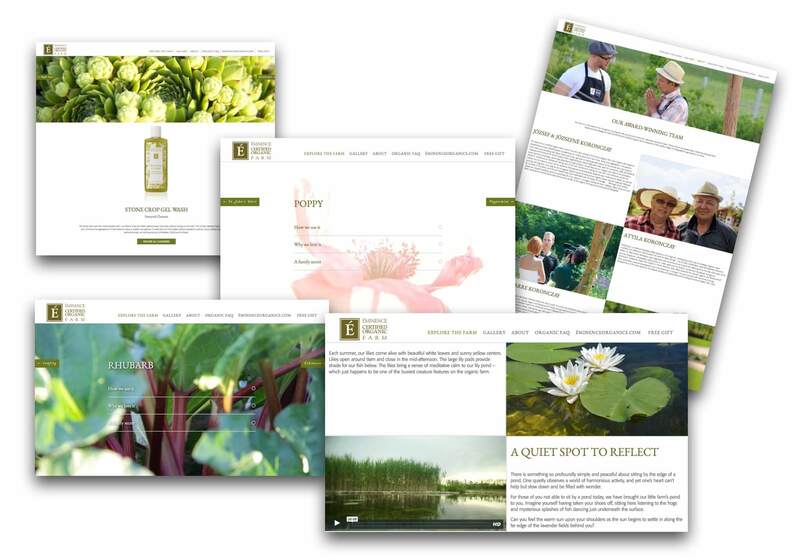 Our project began by producing new valuable resources, starting with a dedicated website for his award-winning heritage landmark organic farm in Hungary. I knew immediately, I wanted the visitor to feel like (a) she was in control of her experience and could be lead by curiosity and choosing; (b) she could stop and explore each and every detail, feeling all 5 senses envelop her; (c) the experience would always drive the visitor back to Eminence Organic Skin Care, educating and increasing brand awareness for the mother company. Oh, and it had to be beautiful, calming, tranquil, ALIVE. The greatest asset we had for this project was the wonderful photographer, Jessica Timberlake. She traveled multiple times to Hungary, spending hours and hours finding just the right shot of each and every detail. Her images show her passion for light and life. Frogs, butterflies, lady bugs and birds seemed to pose just for her. The more we focused on each area of the farm, the more stories we would uncover. It really is a magnificent creation, which is why it has won every possible award, including landscape architect of the year, organic farm of the year, heritage landmark, and many more. While the depth and magnitude of the website threatened to become daunting, we also knew that each and every keyhole, carving, shingle, and traditional symbolism deserved to be honored. For this reason, we would take our time, let each feature have its own spacious celebration, and not let any delicious detail be missed. The visitor would feel lost in wonderment, time could stand still, and one could return here any time to find a moment of peace and organic beauty. When the site was completed, I was asked to create a “Website Walkthrough” video for the company’s annual conference, to showcase all of our special features. I also provided art direction, music and post-production editing for the welcome video on the site’s home page. Here is the background video panel we chose for the landing page, including the farm’s gentle blowing lavender and award-winning grand entrance. Celebrate over 55 years of Éminence Organic Skin Care. Yeee…Thank you for all your help in everything and for all your kindness, Greta. We are super excited to debut the farm website and we just made it mandatory to start all trainings with a screen shot of the Eminence Kids Foundation home page picture with the meal count. That is 12k trainings a year! Thank you so much for the videos as well. Everyone will love it. We are playing it this Friday to the entire company. I truly appreciate your time and flexibility. Upon completion of this amazingly successful project, we were honored to also be asked to create a stand-alone website for Eminence Kids Foundation. A dedicated philanthropist and survivor of childhood Leukemia, Boldijarre founded Eminence Kids, a charitable initiative which provides nutritious, organic meals to seriously ill children worldwide. With these two incredible heart-full projects complete, we are now about to embark on a third project, Boldijarre.com. This may prove to be the most ambitious project yet, as we are charged with trying to capture this vibrant life-force into a fluid, clean user-experience. I can’t wait to get started! !